Volvo Trucks unveiled its newly improved VNX model Wednesday, its first redesign of the heavy-haul truck since it was first introduced at the Mid-America Trucking Show back in 2013. The Swedish truck manufacturer showed off the new VNX truck at its New River Valley assembly plant in Dublin, Va., which assembles all Volvo trucks sold in North America. The new truck is targeted at industries that need to move extra heavy loads such as construction materials, timber and heavy equipment. At the reveal, Volvo demonstrated a VNX hauling a load of logs. Volvo will offer the truck in three configurations. The VNX 300 day cab will have a shorter length giving it more maneuverability for local heavy-haul applications. The VNX 400 flat-roof regional sleeper is designed for truckers on runs that require an occasional overnight. The VNX 740 will have a 70-inch sleeper for heavy hauls over long distances. The truck has gross weight rating that range from 125,000 to 160,000 pounds, depending on the configuration and engine choices. The VNX is another move by Volvo to refresh its North American truck offerings. Last year, the company introduced the VNR truck line for for regional haul and the VNL series for long-haul operations. The redesigned vehicle will compete against an offering from its corporate sibling, Mack Trucks, and vehicles from Western Star, a division of Daimler Trucks. The Kenworth W900, owned by Paccar, is also a major player in the heavy-haul segment. The U.S. market for trucks in the heaviest Class 8 weight segment is controlled by companies that like Volvo, sell multiple brands, often with competing products. Daimler, the largest player in the market, also sells Freightliner trucks. Paccar also operates the Peterbilt brand. Production of the new VNX trucks is set to begin in the second quarter of this year at the New River plant, Borgna said. The new trucks will come standard with Volvo’s D13 engine. It produces up to 500 horsepower and up to 1,850 pound-feet of torque. The stronger Cummins X15 turbodiesel engine is an option. It produces up to 605 horsepower and 2,050 pound-feet of torque. Volvo ceased production of its heavier D16 engine in early 2017 based on limited market demand for the larger engine in North America. The new VNX model also will include a standard automated manual transmission, continuing a trend in trucking away from strictly manual transmissions. Volvo, however, will offer the manual transmission as an option. The addition of the redesigned VNX will allow Volvo to leverage its already extensive dealer network to tackle the heavy-haul market, said Steve Tam, vice president of ACT Research. “They will just go head-on against the guys that are already in this space and let the chips fall where they may,” Tam told Trucks.com. Although Daimler sells the most Class 8 trucks in the U.S. it’s not clear which brand is ahead in the heavy-haul market, said Antti Lindstrom, a trucking industry analyst at IHS Markit. That’s because the vehicle registration data does not identify whether a vehicle is being used for a severe-duty application. 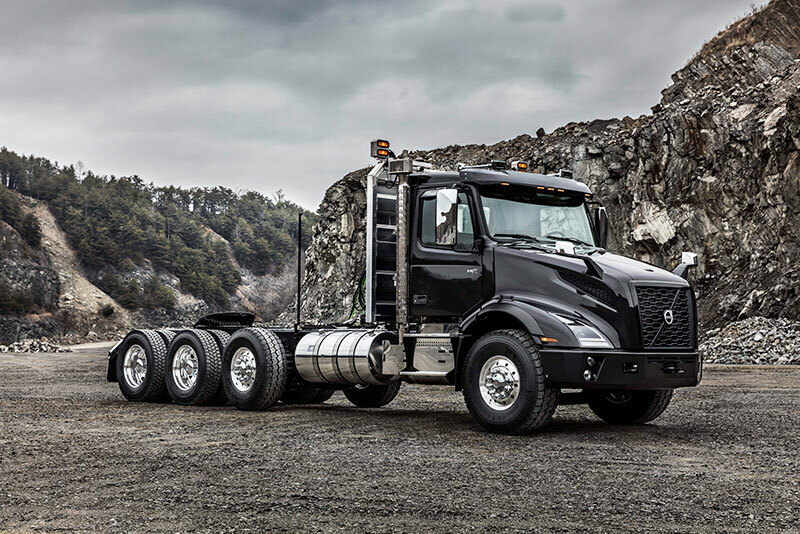 Although Mack controls a large segment of the heavy-haul market, Volvo sees opportunity for a having a second brand in the segment, Lindstrom said. “What I think they’ve done is split the responsibilities between the brands a bit,” he said. Volvo is strong globally in the heavy-haul, said Magnus Koeck, vice president of marketing for Volvo Trucks North America. It sees the VNX as the “first step” to taking similar position in North America, he said. The new redesigned Volvo enters what looks to be a growing market, thanks to a strong economy. The construction sector and the commercial truck and truck equipment industry are expected to continue growing in 2018 and 2019, mostly because of residential building, according to a forecast from the NTEA, a truck industry trade group. Businesses are at a point in the economic cycle where they need to replace heavy-duty work trucks. About 45 percent of trucks in the Class 7 weight segment are 18 years or older, according to NTEA. The figure is 30 percent for Class 8 vehicles. “In short, the construction sector of the U.S. economy should remain a good market for commercial trucks and truck equipment for at least the next two years,” NTEA said in a recent report.